Human beings make an art form out of self-preservation. They invest in scaffolding to hold up the corpse of the Old Adam. More often than not, these scaffolds appear ‘religious’. Re-packaging makes them appear to be new, but they are ancient. The big three are Morality, Mysticism, and Speculation. Although they appear to be significantly different, they all operate on the same premise. They are based in self-effort to reach the Holy. Romans 5:12: ‘Therefore, just as through one man sin entered into the world, and death through sin, and so death spread to all men, because all sinned …’ The strange part of this is that Christians deny that their Old Adam still lives. In fact, the Old Adam works to preserve itself through the three modes listed above. Morality, Mysticism and Speculation are all efforts to preserve the sinful self. The cross is an offense to us not because it crucifies these three, but because it crucifies the self. And, we are unwilling to die. It goes against our nature. We want to preserve that ‘religious’ part of ourselves. 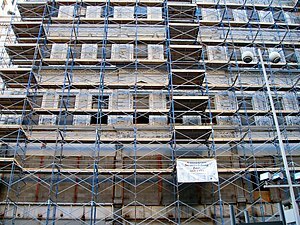 So, we erect one, two or all three of the scaffolds in an effort to prop up the corpse of the Old Adam and loudly proclaim, “I am alive!” when nothing could be more silly or further from the truth. The Morality scaffold appeals to that part of us that says doing good will result in a happier life. In fact, there is a kernel of truth to this in our earthly lives. Morality leads to better relationships, and a ‘clean conscience’. The downsides, however, are guilt and shame (when you realize that you can’t ‘pull it off’ perfectly) or arrogant pride and judgement of others (hypocrisy). Scripture is not just interpreted literally, it is interpreted literalistic-ally. The Mysticism scaffold appeals to that part of us that wants to ‘see God’. Beneficially, people become more committed to spending one-on-one time with God. In a busy world, the experience of retreating can be calming and re-invigorating. The other end of this, though, is that Scripture is a kind of launching point into a ‘cloud of knowing’ (analogous use of Scripture). Ultimately, it denies the incarnate nature of Christ and Christianity. The Speculation scaffold presents a very attractive possibility. It lies within the reason and logic of man. It is ‘familiar’. It leads to a greater growth and understanding of the human mind. It is logical, clear, organized and clean. Unfortunately, it struggles with reality. Speculators look at Christ on the Cross and see it as the stained glass through which one can see ‘God as He really is’. They want to deny that Christ on the Cross is God as He really is … the dying-for-me-God. Scripture is evaluated through the lens of a certain logic, and massive efforts are made to make it ‘fit’ the human mind. All of these have long traditions, histories and adherents. And, it may seem that I am attacking the big three. The real issue is not the big three, though. The real issue is the Adam that produced the big three. This Old Adam wants nothing more than to be left alone by the Jesus who infiltrates our world. He doesn’t want to see a passive righteousness given to us by a God whose greatest work was His passive death on the cross. He doesn’t want to hear that God became sin for us. He doesn’t want to hear that the big three are the beautiful flowers of a plant that is dead. He doesn’t want to accept forgiveness, because he didn’t ‘earn it’. In short, the Old Adam wants to maintain control of his own spirituality. And that, my friends leads to death.